Robot Santa Claus was built in 2801 by Mom's Friendly Robot Company. His designers intended him to deliver gifts to all the good people of Earth on Xmas Eve. 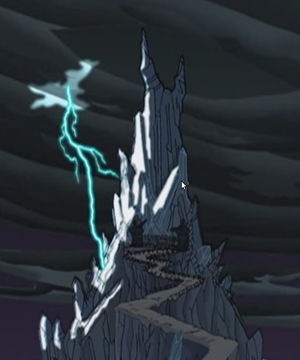 However, due to a glitch in his judgment circuits, his standards are impossibly high, and he invariably judges everyone to be naughty (one exception is Zoidberg, to whom he gave a pogo stick) - and then he tries to kill them. Santa Claus spends most of the year living in his Death Fortress on Neptune. His fortress is surrounded by a small town inhabited by his aides, shrimpy Neptunians. These workers growth is stunted by the lack of food, so they reach an adult height equivalent to the height of a human knee (as opposed to a healthy Neptunian, such as Elzar, who is comparable in height to a human) and they are all unemployed since the toy factory closed down because of Robot Santa's malfunction. He took part in the Battle for Earth, 3007 (alongside his holiday counterparts Kwanzaa-bot and Chanukah Zombie forming the Holiday Trinity) as the Scammer Aliens scammed him, making him too miserable for murder or mayhem. Sleigh guided by robotic reindeer named Trasher and Smasher. He also has a reindeer called Rudolph, whose nose is an explosive. 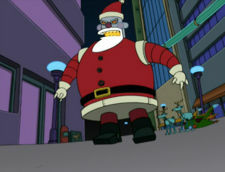 The Robot Santa Claus is the second Build a Bot in the Toynami Futurama Figures. From Series 4 to 6, you are able to collect parts of this toy, to assemble yourself. An exclusive Robot Santa figure was released on July 2008, at the SDCC. It is the same as the Build a Bot version. Zoidberg is the only known character that he has ever been seen to consider being nice, however he may have changed, or it is possible that his judgement of Zoidberg may have been a simple error. Performs over 50 mega-checks of his list per second. He has "paradox-absorbing crumple zones" built into his head, which makes him immune to logical-paradox overloads, which would normally cause a robot's head to explode, destroying them. Robot Santa: Ho, ho, ho! It's time to get jolly on your naughty asses! Robot Santa: I'll be back. Back when you least expect it: Next Xmas! Ho, ho, ho! Robot Santa: You dare bribe Santa?! I'm going to shove coal so far up your stocking you'll be coughing up diamonds! Robot Santa: Fry and Leela, you've both been very naughty! I checked my list. Fry: Well... Check it twice! Robot Santa: I perform over fifty mega-checks per second! Robot Santa: You have all been very naughty, very naughty indeed! Except you, Dr. Zoidberg, this is for you. Robot Santa: Your mistletoe is no match for my TOW Missile! Neptunian: We brought your mail. Santa: Don't you ever knock? Who knows what naughty things I could be watching? I get New Orleans on this thing, you know! Robot Santa: I'm going to tear off your skin like wrapping paper and deck the halls with your guts! Robot Santa: Ho... ho... ho. Oh, my heart's not in it. I'm too depressed for murder and mayhem. Amy: Aw, try some antidepressants. They're gummy. Robot Santa: The scammers cheated me out of my naughty list to use for telemarketing. Can you imagine the harm they could do with that information? I wanted to do that harm! Robot Santa: God rest ye, merry gentlemen... in peace! This page was last edited on 28 April 2016, at 09:31.